Just a few short weeks ago we posted a satire piece called the Halo Bible Study. Today, the Christian Post has an article about how to share your faith using Halo 3. 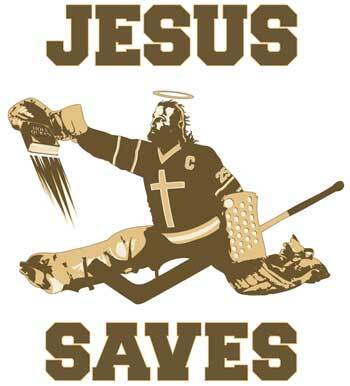 We're fairly certain that the folks buying Halo 3 are not interested in comparing Jesus to Master Chief John 117. They are not looking for Halo 3 to give them a spiritual experience. They want kewl graphics, awesome explosions and wicked weapons so that they can 'virtually' annihilate their on-line friends. 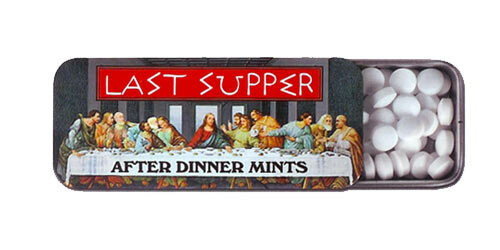 Nothing says "I'm a Christ Follower" more than this Last Supper long box. 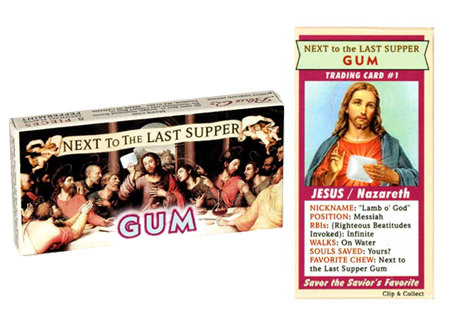 Each pack of this "holy" gum comes with a trading card. 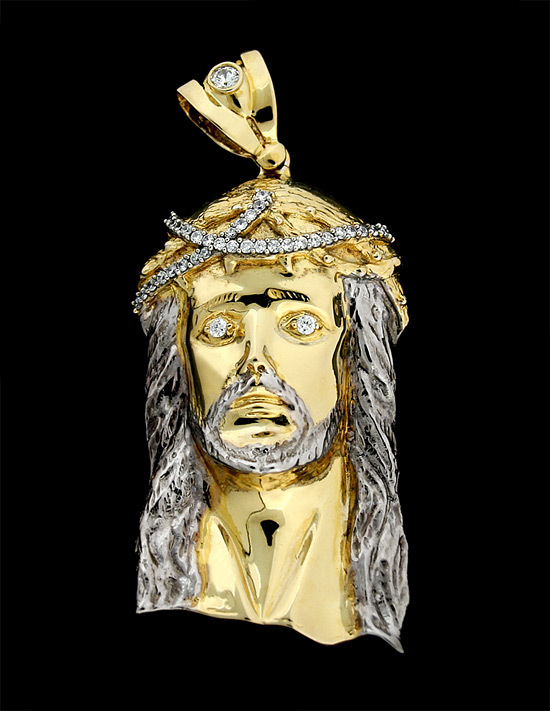 Does your breath smell like unleavened bread and wine? These mints will clear that right up. Here's the product description from the site selling this product. Accept Answer Me Jesus into your life today and the rewards will be everlasting. Jesus offers 20 different answers to help you choose the righteous path. Ask a question and turn him over the answer you seek magically appears. 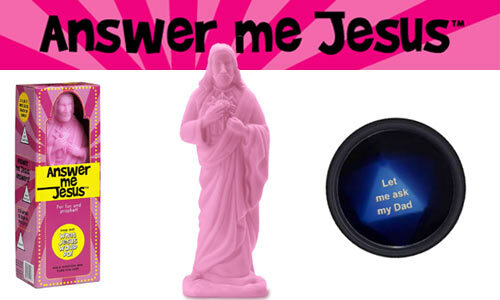 Your personal Jesus will respond with wisdom such as “Have faith”, “Yes my child”, or “Sinner”. 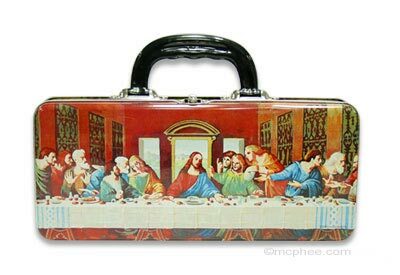 So next time you are pondering one of life's many dilemmas find out what Jesus would do and repent no more! 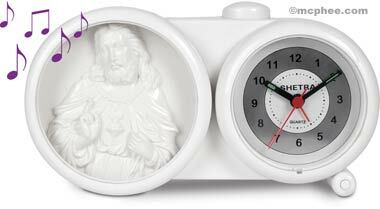 What we find 'miraculous' is that anyone buys this stuff. 1. Mr. Woodcock says the word "sorry" is only for "criminals and screw-ups." Do you agree or disagree? Would you apply those words the same way Mr. Woodcock applies them, or differently? In what way might we all be "criminals and screw-ups"? 2. In what ways might the hard line toed by Mr. Woodcock be a sign of strength? In what ways might it be a sign of weakness? In what ways might weakness, itself, be a sign of strength? Note how the film suggests it takes "backbone" to say "sorry." 3. John says his book has been helpful to people, and Mr. Woodcock replies, "Lot of losers out there, I guess." When have you been tempted to dismiss people as "losers"? Why do you think people tend to look at others that way? Do you (or did you) ever see yourself as a "loser"? If so, in what way? And how do you/did you deal with it? 4. Beverly is in a relationship and has not told her son; and once her son finds out, she is reluctant to accept her son's criticisms of Mr. Woodcock. How do you think single parents should approach new relationships, after their children have matured to adulthood? How would you respond if you had a mother like Beverly? A son like John? Do you "buy" the relationship between Beverly and Mr. Woodcock? What do you think it is based on? 5. How difficult do you think it is for people to relate to parents and teachers as fellow adults, after they have grown up? How has your relationship to human authority figures changed over the years? Have these changes affected the way you see your relationship with the ultimate Authority, i.e. God? If so, how? 6. At the beginning of the film, John has published a book encouraging people to "get past your past." By the end of the film, he is saying that people should "embrace" their past. If you had to choose between these options, which would you choose? Do you think you have to choose between them? What are their pros and cons? We are dumbfounded by this.